The Pygora Breeders Association (PBA) was formed in 1987 by a handspinner named Katherine Jorgensen. Back in the early 1970s, Katherine experimented to get a colored mohair-like fiber like the goat's she saw on a Navajo Indian reservation in New Mexico. 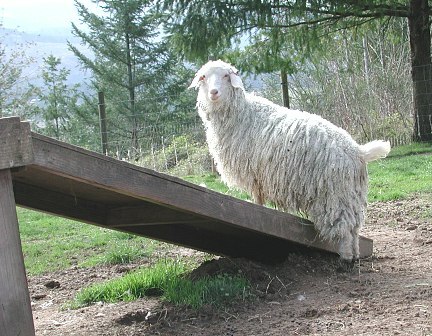 She crossed an Angora goat, for its silky, wavy fiber with a Pygmy goat, for its downy undercoat and colorful fiber. The result turned out to be a truly unique and luxurious fiber. The Pygora Breeders Association (PBA) has it's own Breed Registry. Both parents of a first-generation goat must be registered with the National Pygmy Goat Association (NPGA) and the American Angora Goat Breeders Association (AAGBA). No other registrations are accepted. In order to register kids out of Pygora parents, both parents must be registered with the PBA and meet the Pygora goat breed standards. You can also visit the PBA website at: www.pba-pygora.com for more information about becoming a PBA member and receiving the quarterly PBA newsletter.